I am utterly dismayed by the number of so-called Agile teams I meet who are still, after all this time, building software backwards. Let’s make toast the American way! I’ll burn it, you scrape it. What an incredibly wasteful way to make things: Have one team cobble it together, have another team find all the mistakes, then send all the mistakes back to the first team to be fixed. Still, as long as we’re tracking it all with story points on our burn-down chart, and talking about it in our stand-up meetings, we must be Agile, right? Wrong. A really Agile team would learn how to prevent those mistakes from happening in the first place. Yet time-after-time, I come across scrum teams with a separate test team working an iteration behind the developers, finding all their mistakes. The cost of fixing a defect increases exponentially with time. Defects that fester undetected in the code become harder and harder to remove safely. The longer the defective code is there, the more chance there is that other code will be built on top of it. When the original mistake is rectified, that other code may be broken by the change. The cheapest fix is the one you never had to make. When you write tests up-front, you often spot edge-cases as you write the tests; then you build in support for those edge-cases as you go. If you build software backwards, leaving a team of testers to discover those edge cases, you’ll pay a large penalty for having to go back and introduce the change to existing code. You discover requirements too late. When you practice test-driven development, you prepare for any change to the software by first defining how it should behave when you’re done. If you build software backwards, you may never discover the behaviour you really want until the testers get their hands on it and start asking all those awkward questions. The toast has already been burned. Continuous Delivery will always be a pipe-dream. Many companies, perhaps your competitors, deploy to production several times a day, just minutes after a developer checks in their change. If you have to wait for a separate team of testers to scrape all your burned toast, this will only ever be a pipe-dream for you. When I talk to people about adopting BDD, the most frequent objection I hear is that it must take longer. This is true, in a sense, because it does take longer for a change to get to the stage where a developer is done with it. 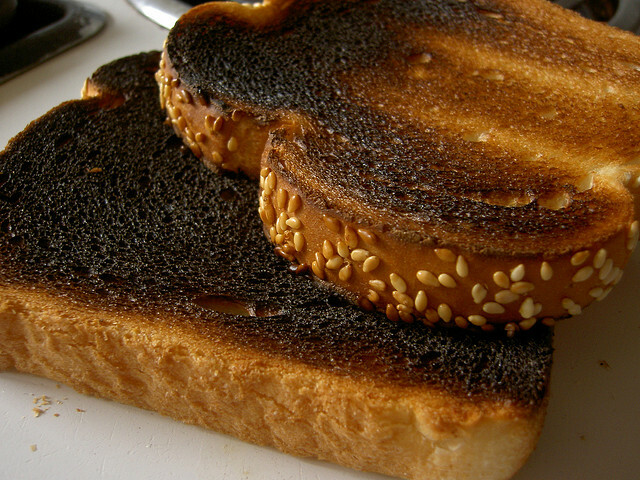 If you’re used to burning toast you’ll find this frustrating, because you don’t realise yet that the time and effort you’re putting in to write the tests up-front won’t pay off until later, when you hand the change to your testers and they can’t find anything wrong with it. To do this takes a leap of faith, so hold your nerve. It will be worth it. If you’d like to hear more about these ideas and learn concrete techniques to make them work in your organisation, I’m teaching a course from March 11-13 in Edinburgh, UK just for you. Click here to find out more. 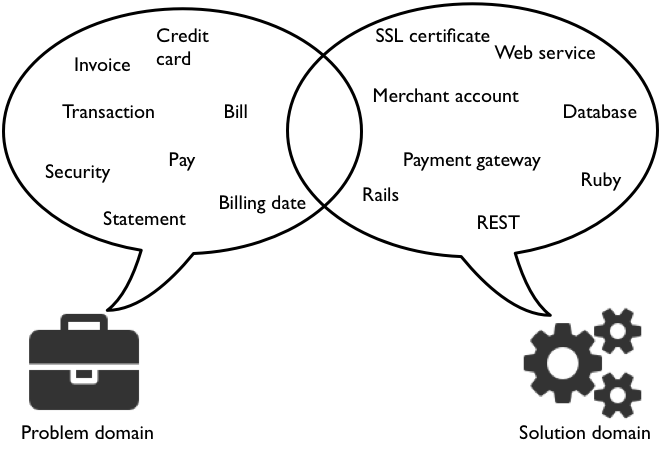 May I submit my billing info to your merchant account via your payment gateway? Your date looks at you askance: nobody talks like that. Do they? In any software project, there are two main domains: the problem domain and the solution domain. The problem domain is where your customers live. The programmers and other technicians working on solving that problem operate in the solution domain. Both of those domains contain funny terminology, a dialect of English you can only learn by spending time amongst the people who speak it. This helps you to figure out which domain you’re in by listening to the language being used. This specialised terminology is inevitable. Both business people and technicians need to use specialist language to communicate effectively with their peers. But what about when those two tribes need to speak to each other? David West’s Object Thinking eloquently describes the natural divide between these two domains, and the problems it causes. In his view, our job as programmers is to build a model of the problem, and allow a solution to naturally fall out of that model. As soon as we start thinking in solutions, we lose sight of the problem and create ugly solutions. This implies that, as programmers, we need to immerse ourselves in the problem domain. Using executable acceptance tests written in plain language helps you to keep your language and thinking rooted in the problem domain. This is why I have such an objection to Cucumber scenarios that talk about clicking buttons and filling in fields: they’re jumping into the solution domain too early. 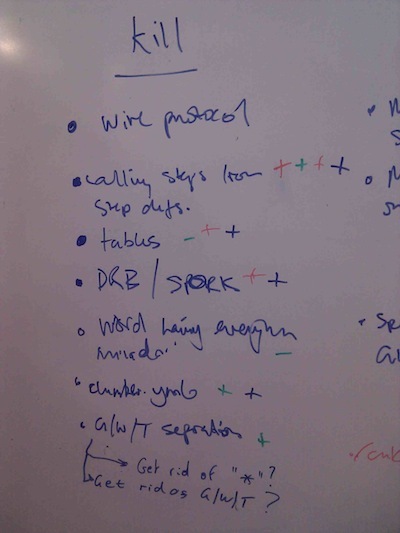 Instead, I like to use Cucumber features as the place where we document our understanding of the problem domain. Writing those features collaboratively with people from both domains helps us to grow that understanding, and increase the overlap between the two domains. I regularly find myself explaining to people the difference between TDD (Test-Driven Development) and BDD (Behaviour-Driven Development). There still seems to be a lot of confusion over this, so I wanted to write this up for reference. Late last year I was interviewed for a virtual panel on InfoQ along with Dan, Gojko, and Liz. Probably the most interesting part of that conversation covered the difference between TDD and BDD. Or rather the lack of any great difference. We’ll start with some snippets from that discussion. TDD – as originally described – is also about the behaviour of entire systems. Kent [Beck] specifically describes it as operating on multiple levels of abstraction, not just “down in the code”. BDD is equally important in this space, because describing the behaviour of systems is fractal: you can describe different granularities of behaviour from the entire application right down to individual small components, classes or functions. Extreme Programming has always talked about writing acceptance tests, sometimes also called functional tests to describe what the customer expects to be done at the end of an iteration. So this is nothing new. What’s new is how we explain it, and therefore how successful teams end up being in making it work for them. My experiences as a coach told me people were missing the point, with all this talk of unit tests, acceptance tests, functional tests, integration tests… Kent Beck’s style of TDD is a very smart way to develop software, so I tried removing the word “test” when I was coaching it, replacing it with things like behaviour, examples, scenarios etc. The result was very encouraging: People seemed to “get” TDD much quicker when I avoided referring to testing. BDD builds upon TDD by formalising the good habits of the best TDD practitioners. That’s basically all there is to it. We want to re-explain TDD in a way that highlights the habits that successful TDD practitioners having been using for over a decade. So what are those good habits? Working outside-in seems obvious to habitual TDD practitioners, but many teams seem to limit themselves to doing this at the level of small units of code. Business-level black-box testing is still done manually, or automated as a check after the code has already been implemented. This misses out of the major benefit of working outside-in, which is having the requirement challenged: if you need to explain to a computer how to check the requirement, you’ll need to be damn sure understand it yourself. If you don’t (and you often don’t) it’s much cheaper to find that out before you write the code. Examples have always been a great way to make sure you really understand a requirement. What BDD does is formalise this by encouraging you to use scenarios to describe behaviour. These examples provide the perfect bridge between the business-facing and technology-facing sides of a team: they’re just formal enough that you can get a computer to check them, but anyone on the team can read them and make sure they’re describing behaviour that they actually want. The GOOS Book, written by two of the best TDD practitioners in the business, frequently highlights the importance of domain language in our programs. In software teams, communication is probably the biggest overhead you have, and you make that communication a lot harder when you allow different dialects of terminology to be used by different parts of the team. Developing and then sticking to a consistent language takes deliberate effort, but it’s something that the best TDD practitioners have long learned will give them a significant advantage. My experience is that BDD’s emphasis on collaboration, and the use of business-readable, executable specifications, means that this shared language develops much more quickly. When everyone is involved in writing documentation that describes what the system should do, they all get a chance to learn the language of the domain together. So BDD really isn’t all that different to TDD. What BDD adds is a clear emphasis on what it takes to make TDD succeed. I was interviewed recently by QCon’s Peter Bell about various subjects dear to my heart: BDD, Cucumber, Relish and hexagonal architectures. So far all of my BDD training has been done in-house as private courses for companies. That’s about to change. 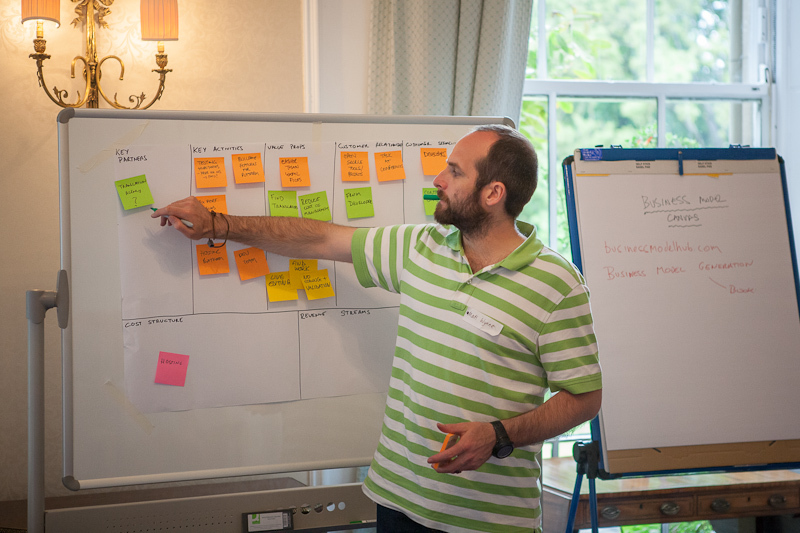 On October 8th – 11th Chris Parsons and I will be running four one-day training workshops in London focussed on BDD and specification by example. These are the same courses we’ve been successfully running in-house for companies like the BBC, Burberry, and Virgin Atlantic. We’re offering a 20% discount to anyone booking before the 1st August. Just use the promotion code super-early-birdy when booking. I’ll be speaking at QCon on Monday afternoon about the use and abuse of other people’s Cucumbers. I’m running a hands-on BDD workshop at QCon on Friday afternoon. You can get a $200 USD discount off the workshop using the promo code ‘bddtutorial’. 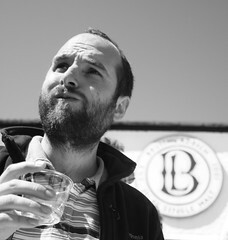 At 6pm on Thursday I’ll be doing an intro-level talk on BDD. It’s aimed at business people, development managers etc who want to get an idea of the benefits of specification by example and a wider BDD process. Sign up here. 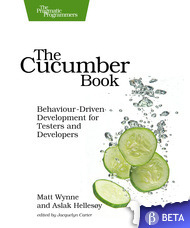 at 8pm on Thursday I’ll be doing my ‘BDD as if you meant it’ demonstration, using the example from the middle section of The Cucumber Book. If you’re already using Cucumber, this should give you some fresh perspective and insights about how to use it most effectively. Sign up here. Finally, I’m honoured to be spending Saturday on the bill with some amazing people at the Gotham Ruby Conference. I’m going to be speaking about hexagonal rails. I’m excited and nervous about this talk, as I feel like I’m still discovering so much about this topic all the time. As well as all this geekery, I’d love to get some proper culture while I’m in town. Are there any locals who would like to show me around? At last month’s CukeUp conference, I held a panel discussion between Aslak Hellesoy, Julien Biezemans, Oriol Gual and Jonas Nicklas. I chose these panelists because each of them has written a variation on the original Ruby Cucumber, and I wanted to try to pull these ideas together into a vision for Cucumber 2.0. This post is a record of that conversation. Why do we need a new Cucumber? The current version of Cucumber has been around since 2008, and as Jonas has previously explained the code isn’t much fun to hack on. It’s quite bloated with features, some of which were added as experiments and maybe aren’t used by most users. 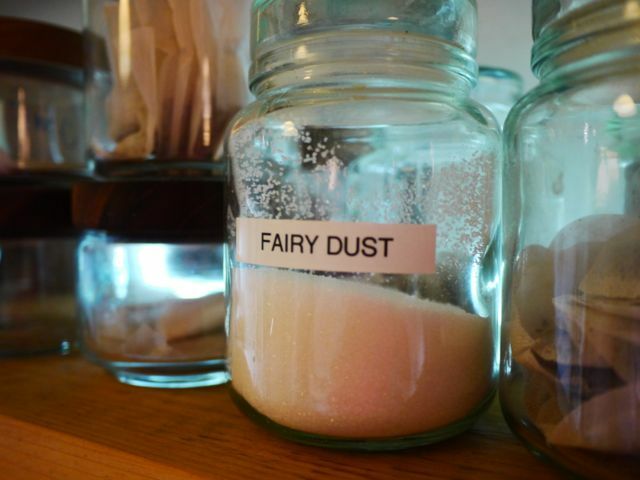 Carrying this cruft around is holding us back from adding new features that we do want. Also, the current mechanism for mapping from steps to Ruby code is pretty basic, and doesn’t really encourage the good practices we’ve learned as a community about organising your test code. I asked each of the participants what they’d learned from their fork of Cucumber, and what they’d like to see in a new version of Cucumber. It should be possible to use Cucumber as a library, so that other tools can be built on top of it as well as the command-line interface. The way steps are defined in Cucumber-JVM, by simply annotating existing methods, allows you to focus on keeping your test code well organised. We should steal this idea for Cucumber-Ruby. There should be a collaborative web UI for writing Cucumber scenarios with non-technical stakeholders. Integrating the Cucumber-HTML project, which is essentially a web-based client for Cucumber, would be awesome. It would be nice to use the Cucumber-TCK, which is growing into a standard set of specs for any Cucumber implementation. He hasn’t implemented calling steps from step defs in Cucumber-JS, and he’s not sure he wants to. Parallel execution – can we make this possible? Oriol echoed Aslak’s thoughts about keeping test code better organised: Spinach uses one class per feature, and is generally more object-oriented unlike Cucumber-Ruby’s flat anonymous blocks for step definitions. He thinks that the reason some people had started to abandon Cucumber was to do with it being perceived as complex. Jumping from plain english steps to Regexps is jarring, and too big a leap in abstraction. 98% of the time you don’t need regular expressions anyway. Turnip uses the concept of placeholders in strings instead to capture arguments. Using RSpec as the runner for Turnip hasn’t worked out so well. What features should we remove? As you can see, we got the audience to come up and vote after the session. It looks like nested steps are living on borrowed time! My view is that with a well-designed core, many of these features can still exist but as plug-ins, thereby allowing people who need them to continue to use them, but without the maintenance burden on the core team. What I’m short on is time. Would it be crazy to ask if there are any companies who would consider sponsoring this project? I can’t imagine a better way to spend the summer than hacking out a brand new shiny Cucumber! Update: Thanks for the comments, but I don’t find they make a great medium for discussion so I don’t tend to reply to them. If you’d like to discuss this post, please chip in on these threads on the cukes google group. If you’re using Cucumber or SpecFlow day to day, or considering them and wondering what benefits you’ll get, I think this interview is worth a read. In this blog post, I will reveal a secret to you. A secret that can get you access to free, hands-on BDD coaching from some of the world’s leading experts like Aslak Hellsøy, Mike Sassak, Greg Hnatiuk, Joseph Wilk and even me, Matt Wynne. Yes, that’s right: absolutely FREE. I’ll give you step-by-step instructions. Point your web browser to the Cucumber issues list. Have a look around. Take your time. Look for issues that don’t already have Code Attached, because we’re looking for an issue that nobody has tried to solve yet. Found an interesting one? Good. Fork the Cucumber repository to your Github account. Now comes the hard part. You need to write a failing test for the issue you found. Start by writing a scenario that describes the way the code should behave once the issue has been fixed. Try to not to just create a file called ‘features/fixissue234.feature‘ but instead try to slot your scenario into the existing features as extra detail about that particular aspect of the system. You might need to create a new feature file, but try to name it according to the behaviour it describes, rather than the bug it tests. Look at the other features for examples of how to write your scenario. Try to use a declarative style where possible. With your scenario written, it’s time to submit a pull request. This is where your FREE BDD coaching will begin. One of the Cucumber team will see your pull request, and will be delighted to offer you feedback on your scenario. You don’t have to wait for the feedback though, you can go ahead and start to get your scenario running. Keep pushing. Every time you make progress, getting the steps of your scenario to actually run against Cucumber, push to your fork and the pull request will be updated automatically by Github’s legions of octocats. Your FREE BDD coach will keep encouraging you with comments and feedback. Now comes the hard part. Once you have the scenario running, you’ve got the bug trapped: it’s time to fix it! Again, your FREE BDD coach will be in your corner. Ask questions about the design of the existing cucumber code, about your code, write specs to isolate behaviour further, and let your FREE BDD coach guide you. Before you know it you’ll have fixed the issue, and your name will be emblazoned in the codebase forever more. This is a great way to get access to some very experienced and friendly software developers and feel good about giving something back to the community. Many wise software craftspeople have already discovered this secret. Isn’t it time you joined them?